New Year – New Plans – New Offers! Happy New Year from Dave and Kate at ideas4writers! We’re already hard at work on the new books we’re planning to bring you this year. Dave is engrossed in Chapter 6 of his novel, Brassica Park, which features the characters Stan and Martha Bean. You may have seen them having little adventures in the 35 volumes of our ideas collection. Now they’re involved in a book-length adventure that will not only change their lives but several other peoples’ too. The writing and publishing industry features quite heavily, of course. (Stan’s publisher is pure evil!) Dave has promised a short teaser next month. Meanwhile Kate is looking after our non-fiction department. She’s currently preparing The Date-A-Base Book 2017 for printing – the ebook version is already on sale. And she’s downloading the source files for the 2018 edition, which they’ll work on together once Dave has finished Brassica Park. The Date-A-Base is our annual collection of forthcoming newsworthy and notable anniversaries. It’s hugely popular with writers, journalists, TV and film companies, event organisers and all sorts of other people, who get to see thousands of things that will be making the news in months, or even years, to come. That gives them plenty of time to research and write their stories and articles, and prepare them for publication or broadcast, to coincide with the anniversaries themselves. The Date-A-Base Books are the subject of this year’s New Year Giveaway. If you buy either the 2016 or 2017 edition during January, you can also choose one of the 35 ebooks* in our ideas collection as our gift to you. If you buy both editions then you can choose two books from the collection! All you have to do is email us (mail@ideas4writers.co.uk) once you’ve placed your order, and tell us which book(s) you want as your gift. If you’ve already bought the books earlier this month, you’re still eligible. This offer is valid until midnight (UK time) on 31st January 2016. *Only the 35 single-category books in the ideas collection are included in the giveaway, not the 5 multi-category volumes. You can see all our books here. Hello! A little while ago I said we’d be improving this blog – and it only partially materialised. The expanded list of What Ifs happened, but not the other things. Also The Date-A-Base Book 2017 was due out in June and hasn’t appeared. So what’s gone wrong? Two things: (a) I was heavily involved in running this year’s town fair, which raised over £1,600 for charity and (b) I’ve hurt my right arm and can’t do very much. The arm thing is all down to what I can only describe as ‘abuse’. Copy/pasting the entire Date-A-Base Book 2016 into date order last month kind of set things off. But on top of that I had to hammer 16 advertising signs into the ground around town for the fair, hammer 4 coconut shy poles into some (very hard) ground, hump some (very heavy) tables around, instruct competitors in the ‘welly wanging’ contest, and so on. My arm is now so well abused that it won’t take any more. The tendons are massively inflamed and I can barely move it. The pain keeps me awake at night, so I’m sleeping at odd times whenever the pain eases a bit. I’m on painkillers and (very strong) anti-inflammatories, and I’ll need ultrasound treatment if it hasn’t improved in 3 weeks. Anyway… all the things I promised previously will still happen; they’ll just take a little longer because I can’t go very fast at the moment. Next week’s blog will feature the Date-A-Base list of anniversaries for January 2016, and the following week we’ll run the same list of article ideas (based on one of the anniversaries) that appears in Ditch Your Day Job: the easiest way to make a living as a writer. Next month should (hopefully) include everything we previously promised in the expanded blog, including the bigger list of What Ifs, 50 Date-A-Base anniversaries for February 2016, and a full page of brand new article ideas based on one of the February anniversaries. In other (very good) news: our missing author, Dr. Ellis Silver, has returned home, according to his family. You may remember that he went missing last August and hadn’t been seen since. We don’t have any other details at the moment; we’re just relieved that he’s home and safe. In due course we’ll ask him about the second edition of his book Humans are not from Earth, but now is definitely not the right time. You may remember that we published an ebook by the American ecologist Dr Ellis Silver last year. The book was Humans Are Not From Earth. Dr Silver is supposed to be working on an extended version of the book for us. He sent us an early draft in July and we hoped to have received the final version by now. Unfortunately when we made enquiries as to why it had not yet arrived we learned that Dr Silver was reported missing in August and has not been seen since. He was due to speak in Portugal on 2nd August, but just hours before the event the organisers received a message, purporting to come from him, saying he was unable to attend. We’ve been advised that there are two worrying things about this message: first, he never cancels this sort of event – it’s completely unheard of; and second, the message (which was sent from his own email account) claims to have been sent ‘from the office of’ Dr. Ellis Silver. This second part is most concerning since he handles his own bookings and doesn’t have an ‘office’ in that sense, so it’s unlikely he would ever use this phrase. We understand the relevant authorities are working hard to locate him and we’ll update you when we hear anything further. We hope he turns up safe and well in the very near future and have sent our best wishes to his family and colleagues. I’ve often recommended Google Reader as a way of keeping up-to-date with the ever-changing information on websites. I’ve mentioned it in several of my books too. The thing is, whenever I recommend something useful the powers that be tend have a tendency to kill it off – and such is the case this time. Google have decided to terminate Reader from 1st July. What madness! Fortunately there are several alternatives, and the best one I’ve found is Feedly.com. Even better, you can sign into it using your Google Reader account (just click a button to allow it – there’s no need to enter your details) and it automatically sets up your Feedly account and copies everything across from Google Reader. It’s more flexible than Google Reader too, so I’m more than happy. (I’m less happy about having to update all the books I’ve mentioned Google Reader in, but at least there’s something decent to replace it with.) Obviously, if you don’t have a Google Reader account you can set up a new one on Feedly and use it to subscribe to all the websites you want to keep tabs on – such as the ideas4writers blog! I’ve been out of action for the last couple of weeks, getting over a virus. I haven’t felt like doing any writing (which is definitely a sign of ill health), and I gave up watching TV at Christmas (for the simple reason that there’s nothing on worth watching). With nothing but reading and Facebook games to fill my time, I decided to try something more productive – so I’ve been learning Chinese. I like to take on a seemingly impossible challenge every now and again, and learning Chinese has always seemed utterly impossible to me. But a website called Memrise makes it quite easy and fun – and quite a lot like playing a game. (You can even compete against your friends to get to the top of the leaderboard). Unlike the usual games though, this one actually has a purpose. A quick reminder that all our books are now available on Kindle. Just go to Amazon’s website and enter ideas4writers in the search box to see the full list. You”ll find all 35 books from our writing ideas collection, plus The Fastest Way to Get Ideas, The Date-A-Base Book 2014, and How to Win Short Story Competitions. We’ll be adding The Date-A-Base Book 2013 this week, and The Fastest Way to Write Your Book (2nd ed) should be released in about a month. All of these books are also available in PDF format from the ideas4writers website, and The Date-A-Base Books are also available as printed copies (though the 2013 edition is almost sold out). Printed copies of the other books will be available later in the year. ideas4writers – inspiring you since 2002! 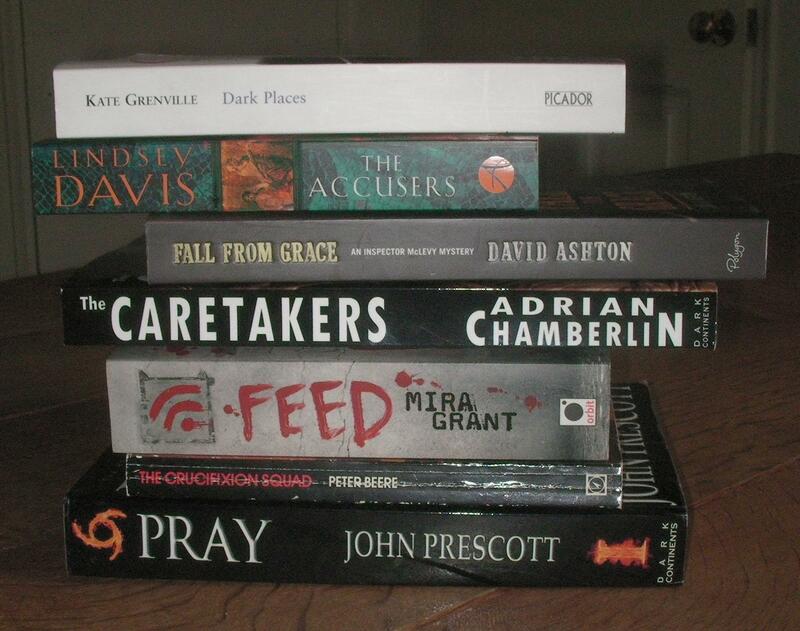 One of our members recently introduced me to book spine poetry. You make up a poem using the titles of books you find around you. Stack up the books to spell out your poem, and take a photo. It’s easy, great fun, and highly addictive. 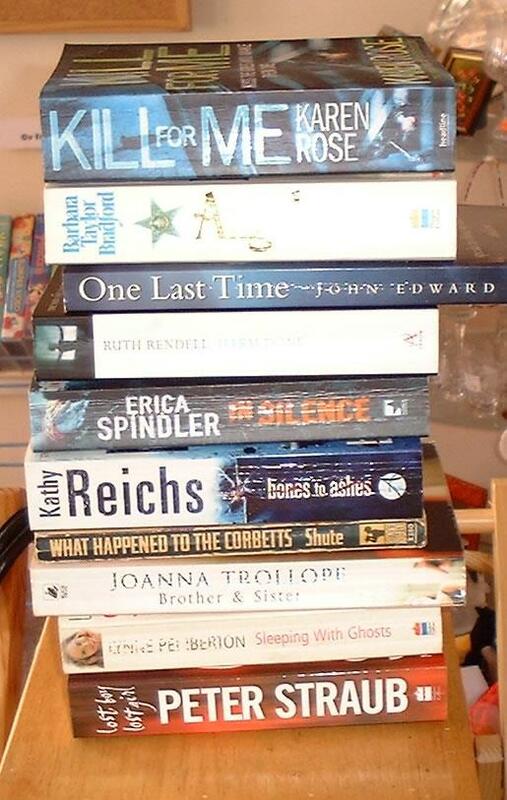 You’ll find several more book spine poems in our Facebook group (facebook.com/groups/ideas4writers). Come on over and have a go!